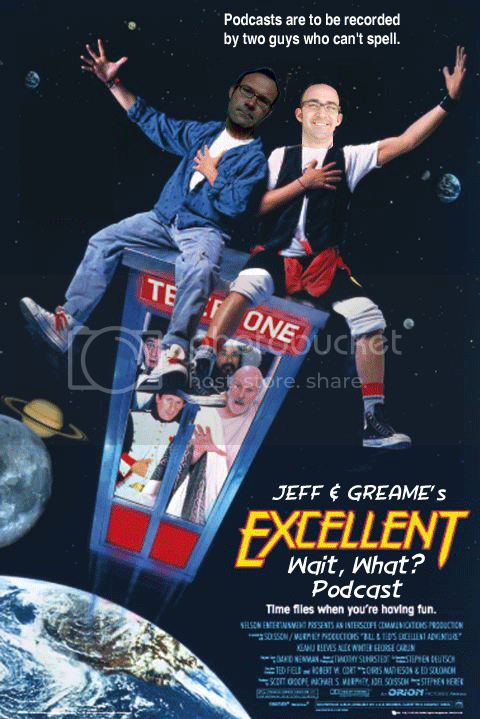 First off, our new graphic is courtesy of the incredibly talented Adam P. Knave (who on top of all the other things he does and does well, has added podcaster to the mix. Go check out The Glory, The Glory, why don't you?) and our old dashed-off scattershot introductions to the podcast, courtesy of me who has once again managed to land himself behind a scheduling eightball. But! That doesn't mean we didn't attend to our duties, as far as answering your questions go. On the contrary, Episode 84 of Wait, What? is our first hour and forty five minute foray into the savage wilds of your inquiries. Among the ground covered by Graeme McMillan and me: our recommendations for DC Showcases and Marvel Essentials (both real and imaginary), the fall of Vertigo's Sincere Age, Alan Moore and the plight of 1963, our Free Comic Book Day picks, the damning influence of Big Question Mark, event comics, follow-ups to articles discussed without being read, work for hire vs. creative owned work, Steve Gerber and Foolkiller, Submarine, Elite Squad, our favorite comic book city, and assorted cage matches and Hunger Games. As always, thanks for listening and we hope you enjoy! Alan Moore, Big Question Mark, Bugtown, DC, Elite Squad, Essentials, Foolkiller, Graeme, Image, Image Comics, Jeff, King City, Marvel, Metropolis, Savage Henry, Showcases, Steve Gerber, Submarine, Vertigo, Wait What?